Stressing over a place to meet a Tinder date? Trying to find somewhere less generic than Starbucks? Look no further than Bourbon Coffee, where a chill atmosphere and light background music provide the perfect setting. The menu offers something for everyone, so don’t worry if your date isn’t a coffee fanatic. The hot chocolate ($2.50) is rich and soothing. 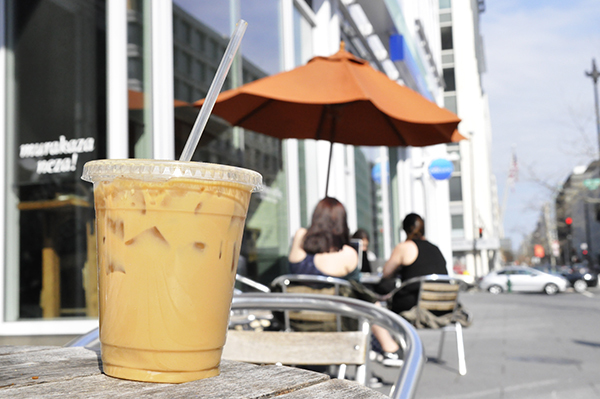 Or, try a uniquely flavored drink – like a cinnamon spice latte or a macadamia nut mocha ($3.45). The cafe evokes the art and culture of Rwanda, with woven baskets and art adorning the walls and vases lining several bookshelves. It gets its coffee beans directly from Rwandan farmers, rather than an exporter, to support the local agricultural community there. Warm lighting and a rich color scheme of burgundy and mahogany provide a good mix between romantic and casual – perfect for a Tinder date. But beware – Bourbon is also often crowded and its tables are cramped. If you aren’t ready to cozy up to your date, snag a table outside and get some fresh air.